Interior design has always been my passion, and I even took some classes back in the days in order to pursue my passion. Although I earn my living from something else, I still offer people my advice regarding interior home and industrial decorations in order to create their perfect, harmonious spaces. It is now extremely easy to gather all the information you need in order to become a good interior designer, as there are numerous design blogs nowadays. From other passionates just like me to rewarded architects and designers, as well as specialized publications, everyone loves to write about interior designs and brag about their achievements. If you want to give your house a new flow, if you’re planning on redecorating only one room or simply want to change something, I suggest you follow these specialized blogs and learn from the best. One of the most appreciated fashion & lifestyle magazines in the world has opened new horizons by launching their own regular publication exclusive for interior decorations. It is a good starting point if you want to find new tendencies, read general information or get to know the decors created for several industrial spaces. In my opinion, the publication provides decent advice for the beginners and some of their articles are truly on point. However, as with most paid advertorial magazines, Elle doesn’t always promote the cheapest designers and interior decorations. So, if you’re not a millionaire, you’ll have to start learning some DIY tips if you want to make your house look posh and fashionable. Just as the name suggests, this blog mainly focuses on creating unconventional living spaces and make the most out of the space you got. I know living in a big city is not always cheap, and the real estate choices are rather poor and limited if you’re looking for large spaces. So, I like the on-point articles about apartment decorations you can actually purchase without spending a fortune, as well as the ingenious solutions for making the most out of a small and crowded room. From what I’ve seen this is a rather popular blog amongst youngsters and “the Millennials”. Fast-forward solutions to all your interior decoration problems are found in this small blog. It mainly focuses on specific decorations and not as much as on furniture pieces or lavish constructions. I say it is a win-win for those who are young and want to find an easy solution about redesigning their rooms or studios without spending a fortune on furniture pieces and heavy decorations. I suggest you take a look at all of these blogs and do your own further research if you are looking to find specific interior decorations for rooms. It is amazing how many things you can now do with your own two hands and a little bit of research, so why not try reproducing some of these designs with minimum costs and maximum intelligence in your own personal projects? There are so many countertop options to take into account that you might risk picking the wrong one just because you don’t have the patience to go through each and every one anymore. I have decided to make a short list of the ones that I have found to be most durable and useful over time and God knows that I have tried several over the years. Plastic laminate is one of the cheapest alternatives you’ll find, and I suppose it’s useful because it can withstand the test of time and is rather hard-wearing. Something that you need to consider, however, is that there are two types available for sale on the market. One of them is a general-purpose one and the other is for cabinet doors, backsplashes, and drawer faces. So, obviously, you need to make sure that you’re getting the first choice. Ceramic tile is another material that you might be interested in. Some people don’t like it because it’s quite cold and because it seems to be dated. There used to be a time when most countertops you’d find in kitchens would boast ceramic tile on their surface. I need to add that, whether you install it yourself or not, it’s crucial to use tile for floors instead of that which has been designed for walls. The one on walls is far thinner than the other, so it’s likely to crack ahead of time. Wood is another great-looking material, but the main problem with it is that you’ll scratch it by accident. There are several studies that suggest that tiny cracks in wood countertops can lead to bacterial buildup. So, in this respect, it might not be the safest choice of all. Plus, depending on the type of wood, it might actually cost a pretty penny. In the end, although it might look great, the downsides are just too many to go for a wood countertop. Concrete is a material that you should give some thought to if you’re into the looks of granite. The latter often costs way too much for the regular homeowner, so you might have to do without. A high-quality counter made out of concrete can start at about eighty-five dollars. Soapstone starts at one hundred dollars and slate countertops are in the range of two hundred dollars. What I’m trying to say is that you need to make sure that you think ahead of things. On the one hand, you probably have a budget you have to stick to, to avoid spending too much because the countertop is just one part of your kitchen. On the other, you need to ensure that you’re getting a durable material and one that, unlike wood, won’t risk endangering you and your family. As some of you might now, one of my greatest pleasures is making furniture by working with wood. Recently, while crafting a new shelf for my granddaughter, I was talking with a friend of mine that had dropped by about how easy it is to put together your own workshop by making use of what you already have. So, today I have decided to share with you the ideas that I used when I was building my own, as some of you might find it of use. Because nowadays it is difficult and expensive to construct a workshop from scratch, my advice to you is to follow my example and transform your garage into your personal crafting room. If you are lucky enough to have a large room at your disposal, why don’t use a separating wall to divide the space? By doing so, you will have a place for the car, and enough room for your own DYI projects. Another important element that you should make sure you have is proper lighting. We’ve all heard about horrific accidents people have suffered due to not working in fitting conditions. To make sure you save yourself from this kind of unfortunate situations, invest in good lighting and don’t overcrowd the space by getting stuck with stuff you don’t need, as they will end up staying in your way. To enhance the light, paint the ceiling in a bright shade of white, as this will help diffuse the light evenly. 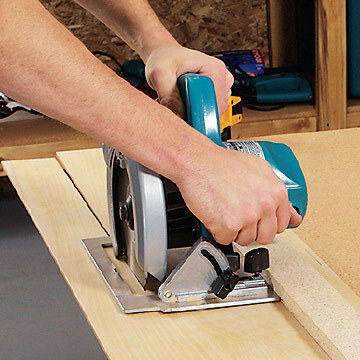 Also, keep in mind that open floor space is a must when you have to use tools such as a circular saw. 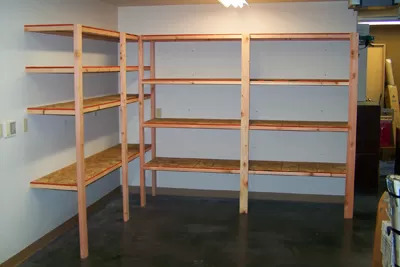 More than that, you can save space by constructing shelves where you can place the small tools and devices; this way, you will be making smart use of the space by avoiding using sizeable cupboards. Securing the benches to the walls is another method that you can use with the same end result in mind. When speaking about the floor area, the flooring should be plain cement, so that you can easily clean it and you avoid tripping on mats. However, if you want to have the best workshop and don’t mind making a small investment, I suggest you cover it in rubber. And, yes, I know this might seem a bit over the top, but, if you stay and consider all the arguments for it, you’ll reach the same conclusion; rubber made floors are easier to clean and walk on. Moreover, if by any chance you are a bit clumsy and tend to drop tools, by making this investment, you also make sure that your devices are a safer from serious damage. Building and equipping your own workshop is not an easy job, especially when you have to consider what kind of tools to buy when working with wood. Therefore, because I believe there are quite a few people who enjoy carpentering as a hobby as well, I have put together a list of what I consider the most important power tools one’s workshop cannot go without. Because drilling is not something you can do without the use of a machine, one of my favorite tools that I’ve bought is a drilling press. I personally enjoy using a compact model that works well with both wood and metal. However, before buying such a tool, make sure you select one that is precise, easy to use and that fits well on your worktable. I suggest you settle for a model that was designed with a table raising mechanism, as this option allows for precision and it comes in handy almost all of the time. Additionally, the chuck quality should also be considered, as it is a feature that will prove helpful when drilling. 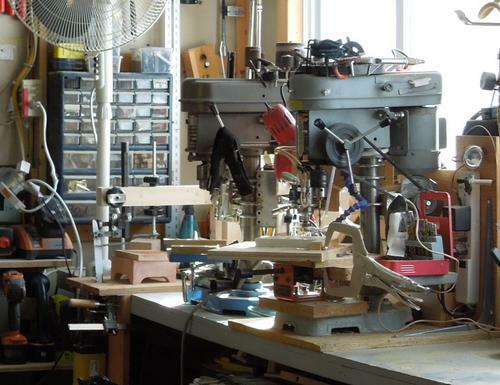 If you don’t know ‘what is the best drill press?‘, I recommend reading expert review sites. Although manual screwdrivers are perfectly good when performing small, once in a while repairing jobs, once you want to focus on building wood made objects that require a lot of effort, an electrical screwdriver acts as a day saver. Moreover, you have to take into account the fact that the materials you have to insert screws in have different degrees of toughness, so you have to make sure you don’t overuse force and grow yourself tired. Woodwork, even when done as a hobby, involves a lot of (wood) cutting. Because of this, a circular saw is always a convenient tool one can use. The main feature you should search for in such a device is the blade diameter. In my personal opinion, the best dimensions are 7-1/4 inches. By opting for this common size, you make sure that your new purchase will be able to cut both small and large sized pieces of wood without any problems. To make sure you get your hands on a safe model, make sure the circular saw you are buying has the electric brake feature. Thanks to it, you will be able to stop the device in less than 2 seconds, in the case of any unfortunate accidents. These three powerful tools are the basic devices any workshop should contain. However, I am a carpenter by hobby and my choices are based on my particular needs. 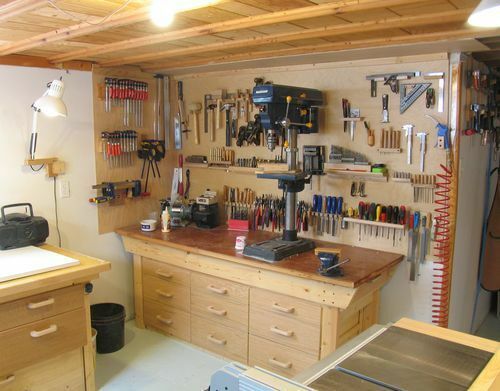 Nonetheless, everyone who wants to build his/her own small workshop should think about what he/she wants to build in their free time and chose their tools accordingly. Now the 70s had my kind of music. Brilliant!